Batteries and a touch up on the hull. Empty jump. the crew braces themselves as they ready for another dive. hostile encounter; Elite Fighter armed with Burst laser II, Burst laser III and Vulcan. As the exit beacon's in a nebula, there's no ASB firing on us, and with our Cloaking we safely jump away without taking damage. Prod? It's been over a week. 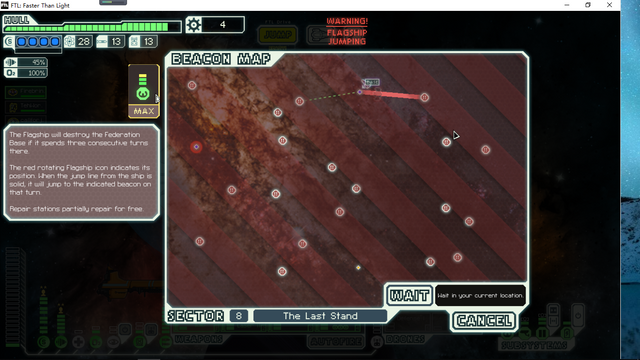 Sector 8 Soundtrack "Last Stand"
"This is Lieutenant Firebringer, in command of the "Run1" Kestrel-class Cruiser. 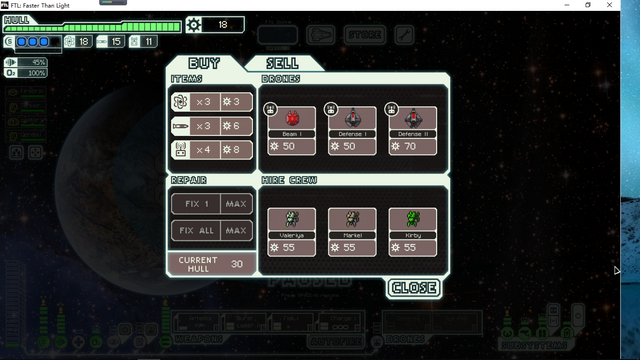 The Captain and the other guy's on vacation, so it's up to me, a civillian doctor and two mercenary mantises on board. Also we're here to save the day." 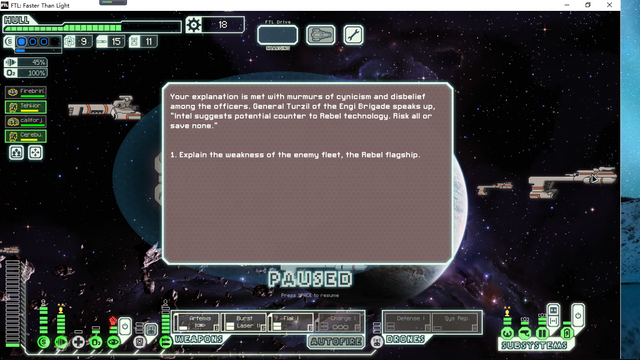 Explain the weakness of the enemy fleet, the Rebel flagship. 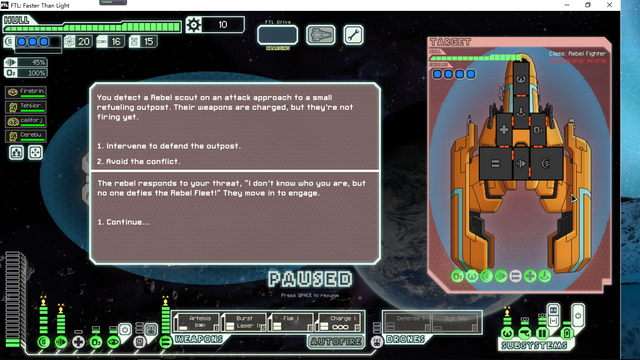 "Well, according to super-secret-super-accurate information, blowing up the Rebel flagship somehow wins us the war, so that's what we're planning to do." The Lieutenant gathers his crew after they've dispatched of the hostile boarders. A speech and a rally later, they were good to go. The store held nothing of desireable purchase, but itself occupied a tatically crucial jump beacon. When the Rebels arrive here, they ought to burn this place to the ground. 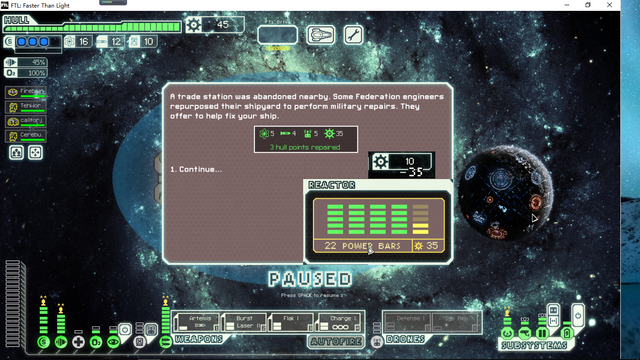 Before we make it to the Rebel flagship, there's a few jumps we need to survive through, and this one is no exception. 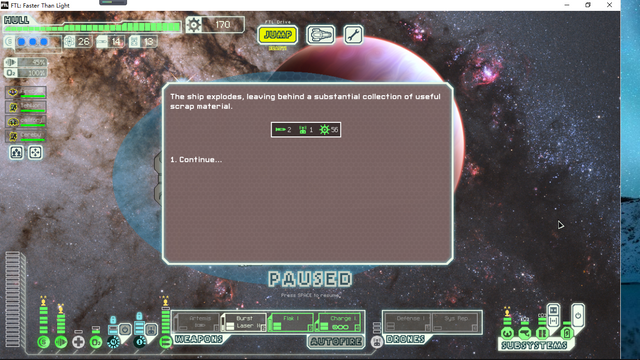 We take a few missiles to the hull, but otherwise cleanly defeats the current contact. 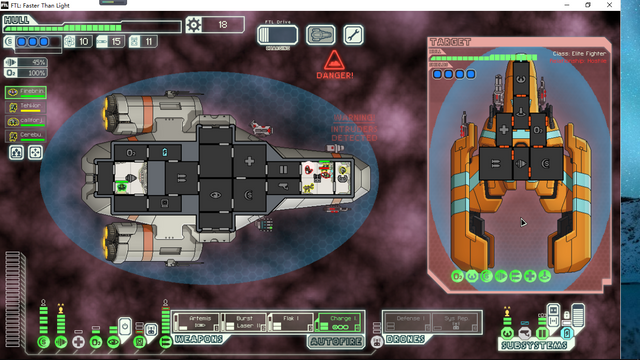 A formidable opponent, armed with a 3 laser salvo, Halberd beam and a small missile launcher. 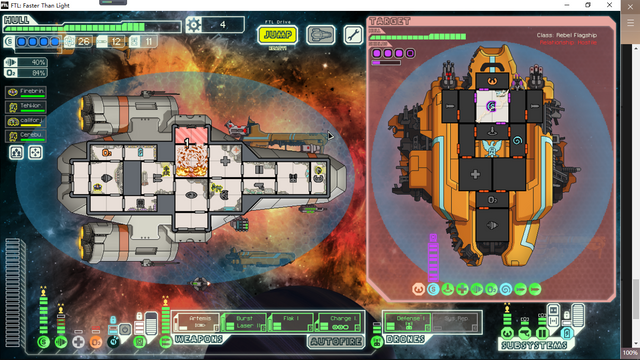 Our fully upgraded Hacking system makes short work of the enemy Shields, our weaponry makes short work of the enemy hull, and our Cloaking, Defense Drone and mantis crew makes short work of all hostile attempts from the enemy. Cloak enemy missile, hack enemy Shields, shoot enemy. Here we are, a jump away from the Federation base. As the Rebel flagship already arrived at the base, once we make the jump, we cannot jump away. So whatever system they decide to hack, we're sticking with it. final boss time team - good luck!!!! 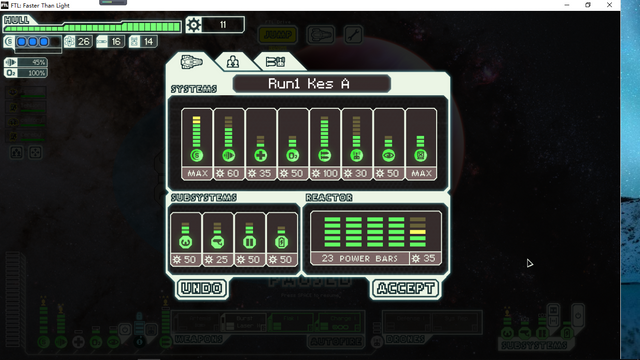 Phase 1; Cloaking 3, Hacking 3, 15% dodge and full weaponry (3x1 dmg Ion, 3x1 dmg Laser, 3x1 dmg Missile, 2 dmg Beam), no overcharge. 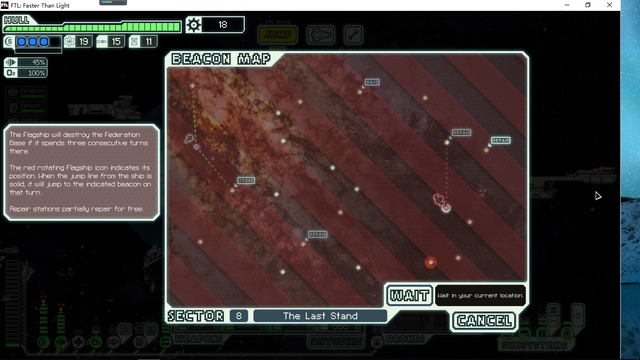 For our current loadout, Phase 1 of the flagship is probably the easier phase to fight. 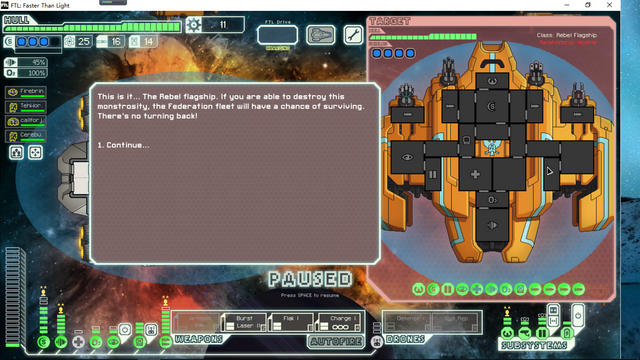 The flagship's hack is on our Drone control, which is something we weren't planning on using this fight anyway. The fight goes; Cloaking 1 to avoid flagship missiles, Hack flagship Shields to completely take down the 4 layers, Artemis flagship Piloting and expend the rest of our firepower on the flagship Shields/Missiles. Phase 2; Drone Control, 25% dodge? and 3/4 weaponry (3x1 dmg Laser, 3x1 dmg Missile, 2 dmg Beam), mass drone overcharge. Compared to Phase 1, Phase 2 loses its Cloak, Hacking, Doors and Ion weapon, but it gains Drone control (Terminator Drone, Defense Drone I, Combat Drone I, Laser Drone I), a mass drone overcharge, as well as additional dodge. 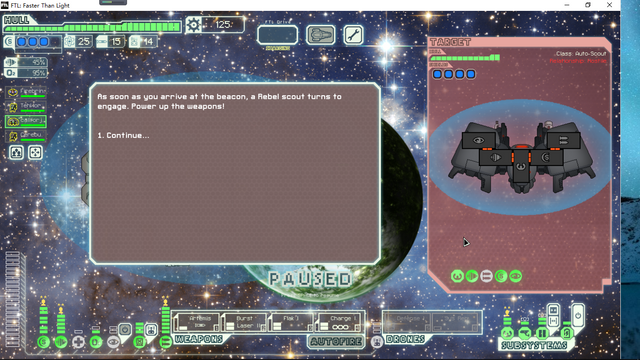 An Artemis is sent slightly before the Hacking drone to ensure the Hack doesn't get shot down by the flagship Defense drone. Cloak 2 is used to dodge the first missile strike + mass drone overcharge, but I guess the cloak was late enough for a missile to hit our Drone control. 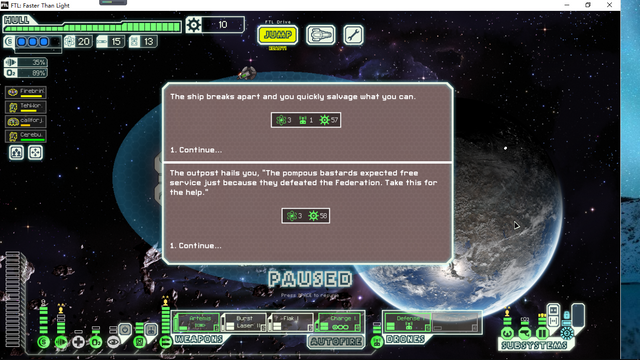 Our first barrage barely dents the enemy ship. Another cloak vs missile strike + overcharge, and this time our firepower makes their mark, as the enemy's Piloting and Shields are completely offline. Upon taking another hull damage from the Terminator drone on our Sensors, Phase 2 is over. you can do it Urist!!!! I believe in you! Phase 3; Mind Control 3, Teleporter 3, 35% dodge? and 2/4 weaponry (3x1 dmg Laser, 3x1 dmg Missile, both firing 10 seconds faster I believe), Zotlan Shields, 8x1 dmg Laser overcharge, Zotlan Shield overcharge. 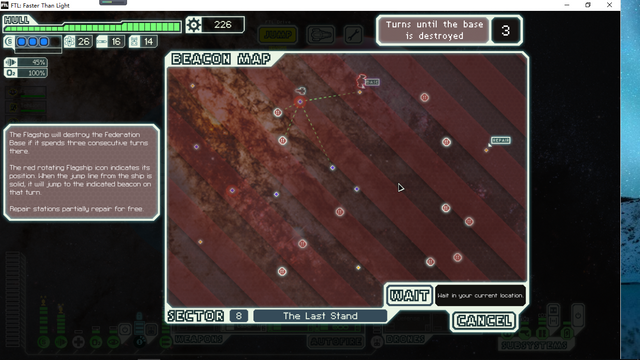 We have no intentions to defeat the flagship at this jump. What we're doing is baiting the enemy boarders to teleport onto our ship, jump away and dispatch of the hostile crew. The cloak was utlized to avoid the 3 missiles. 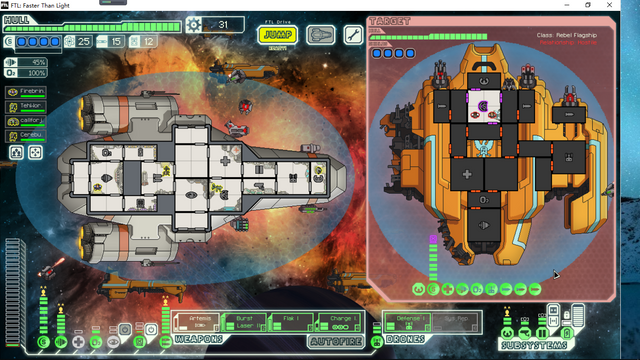 The flagship laser overcharge + laser weapon/artilery deals a damage to our hull, we otherwise jump away with 4 hostile crew members neutralized. We ignore the mind control on Firebringer and began to whittle at the flagship Zotlan Shields. 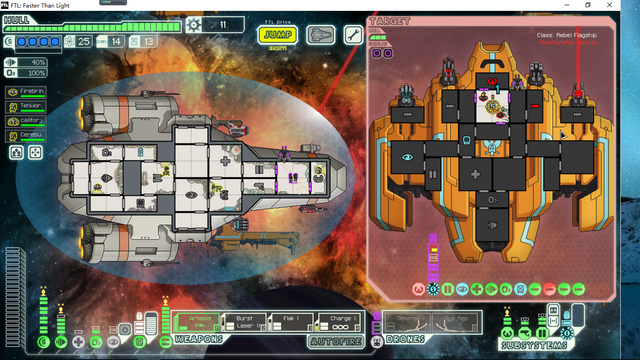 We tank the missiles on the hull and saves the cloak for the laser overcharge. 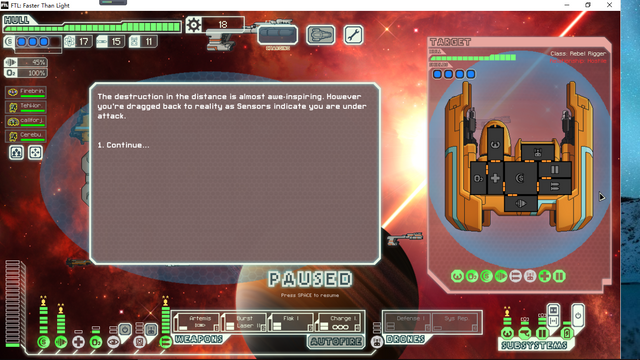 The Zotlan Shield is down, and the same tactic goes; Hack on Shields, Artemis on Piloting. As long as we finish this fight fast, any non-crucial damage we take can be completely ignored. 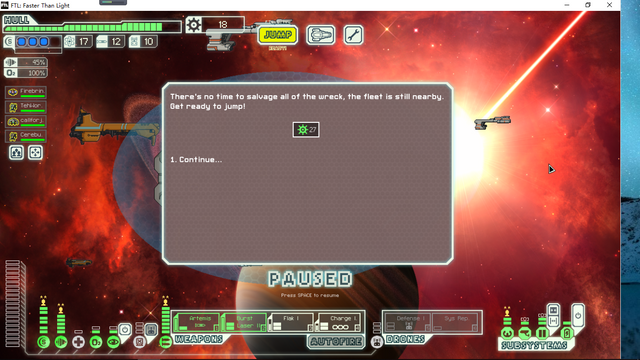 Lasers, missiles and flak hammers the flagship's hull. With the enemy's Shields and Piloting completely down and overcharge safely avoided, one more missile and three more lasers seals the fate of the enemy. 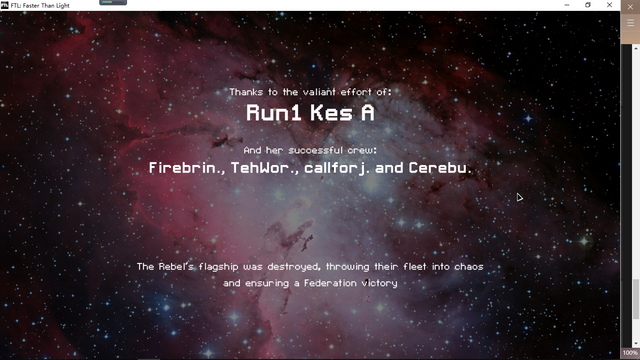 Yay, the Federation is saved! This was fun. Thanks for modding it. Reading through this inspired me to continue some work on an old balance mod to FTL that I'd been working on ages ago, designed to increase the variety of games by making more items viable. (Unlike some balance mods, I didn't do much nerfing of overpowered things; it's more buffing of underpowered things to allow them to compete. Missiles are really good now.) Of course, more viable items means that the enemy's strategy is more likely to work out, too. 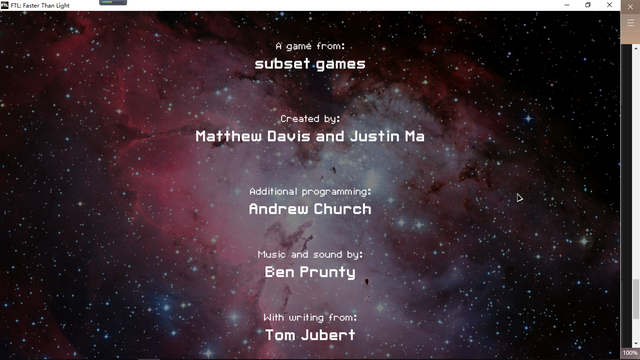 It's not quite finished, but it is playable; I was wondering if there'd be any interest in something like that for Run 2? One advantage is that as most people here won't know what stats items have in advance, it'll produce less of a gulf between crewmembers who know what they're doing and crewmembers who don't. That sounds awesome! I'm not particularly consistent at the moment, so I don't think I'd be in a position to mod it. But I would be very keen to follow a run using your balance mod, CFJ. This was a lot of fun, but I suspect that if it were repeated in exactly the same format, it would get a bit stale. In general, the crew here was too knowledgeable and coordinated for much to go wrong strategically, and PvtUrist is clearly experienced at micromanaging the tactics. What this really needs is a bit more chaos. So the idea I had was to do this again, except without anyone having a full view of everything that's going on. We split the various aspects of the ship among the participants, and each participant gets told (in PT) about the status of their own part of the ship, but not about what's going on elsewhere in the ship. Then they make general strategic decisions (which they can change whenever they want), tactical decisions if the moderator suspects that the result might actually matter, and (of course) purchasing decisions. Anyone could post in the main thread; the moderator will post general updates there (descriptions of events, etc. ; ideally paraphrasing to make it harder for experienced players to recognise the event), and players can talk about their view of things in general terms but are banned from direct moderator quotes and talking about numbers/statistics directly. 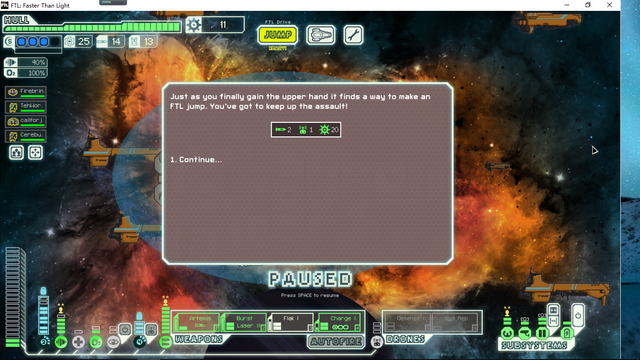 Instead of voting on what to do with the ship's resources, we divide all the earned scrap evenly between the players; each player unilaterally decides what to buy with their own share of the scrap. They're allowed to trade with each other at will (so everyone can pool their scrap to buy something expensive if necessary, or handle cases where some players need to spend more than others, as the various ship management roles won't be exactly balanced with each other). Of course, players could also lie about how much scrap they needed for various things (this is the advantage of playing on a mod; nobody will know how much things "should" cost). 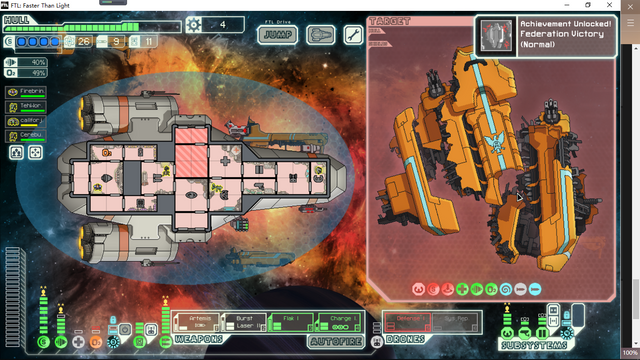 We could also add in personal secondary victory conditions which were mildly in conflict (on top of the primary victory condition of saving the Flagship), just to force a bit of tension. Is this a terrible idea? Or an awesome idea? Because if people like the idea, I'm willing to run it. I would be incredibly down to play that. It sounds like a blast. OK, looks like I'm running this then! Here's the game thread. Signups are open right now (and will stay open continuously, because we may well have a lot of crewmember turnover).